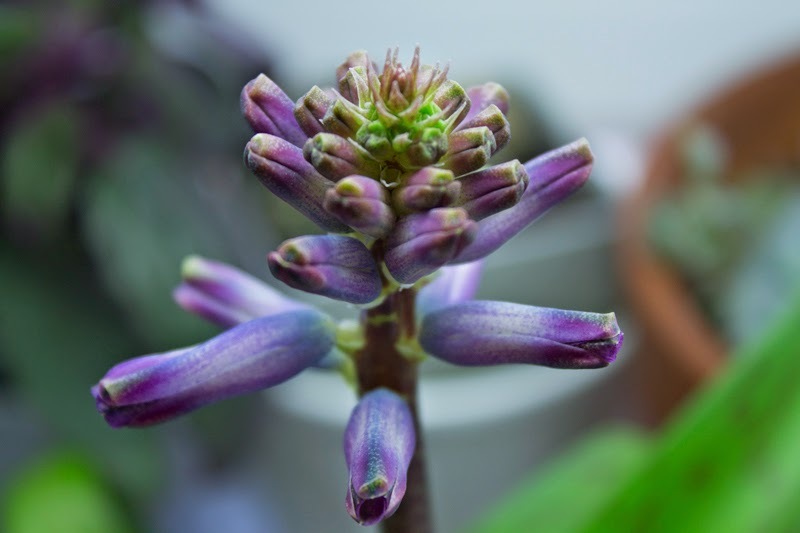 Chubby, compact and upright were the qualities that had fascinated her over the past year or so-- the qualities that led her to plant seven varieties of torch lily, four different pineapple lilies, and now, Lachenalia, an African plant with no common name that she could find. This latest was something she stumbled on as she poked around the web researching some topic or another for a magazine feature. Detours were common in the life of a writer, especially a modern writer who no longer traveled to a library but learned all she needed from a Google search. Any color besides salt-melt grey was an apparition in a Midwest winter. But a flower of iridescent violet streaked with chartreuse was especially welcome. Easy to Grow Bulbs, a company in California, was just what she was really looking for, after all. Lachenalia 'Rupert' is just beginning to open. Grown from a bulb, Lachenalia is a member of the Hyacinth family. And like the Dutch hyacinth, Lachenalia blooms in spring. 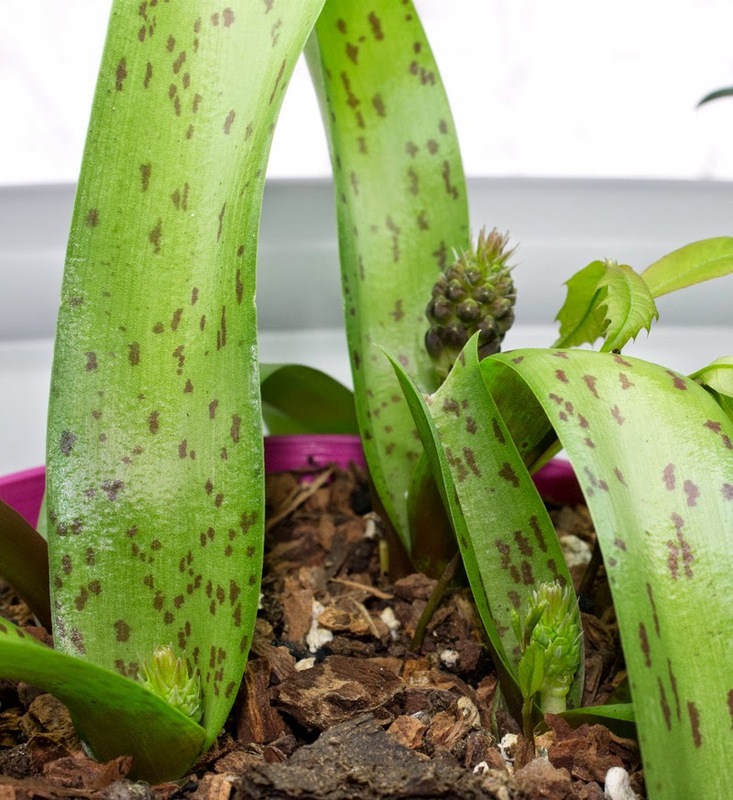 And since it's not hardy, the desperate Midwestern gardener potted up six bulbs indoors in a mix created with a generous helping of orchid bark and gave them as much light as possible as they prepared to make their entrance. 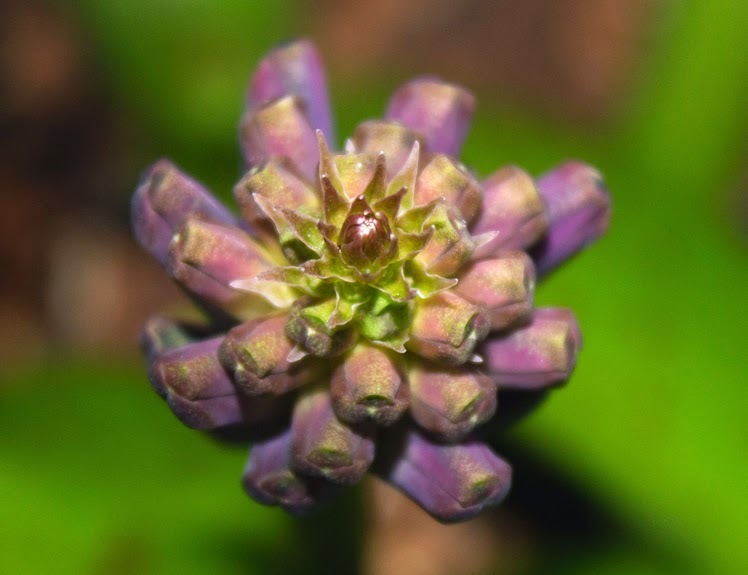 From the top, Lachenalia shows off its closed-up flowers that look like purple tootsies. 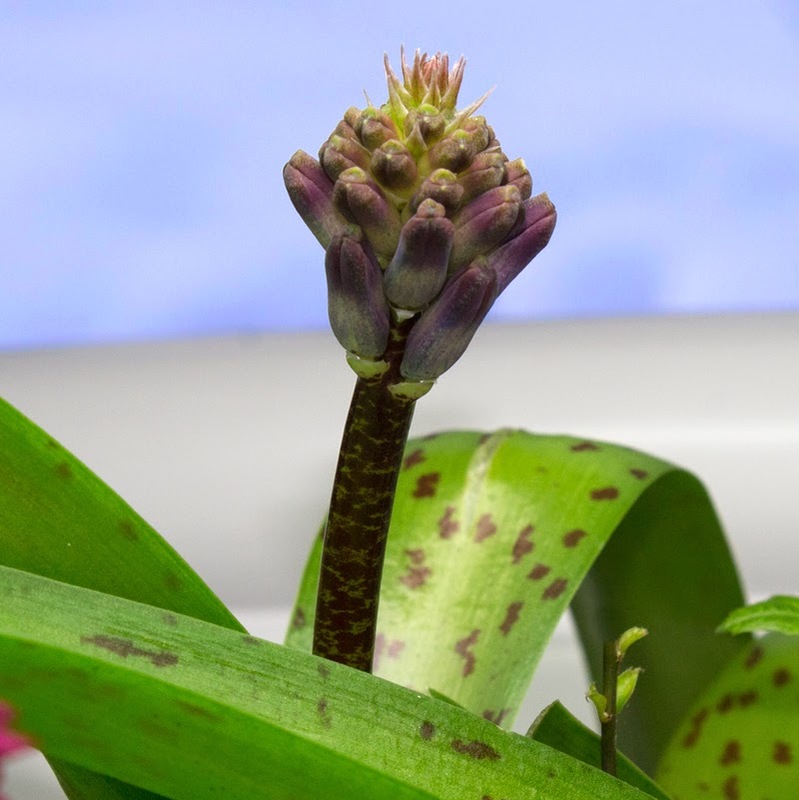 While success has revolved around this one bulb, two others have formed flowers, albeit in a much slower fashion. This, she figured, is a result of planting depth. And now, as the one that's tallest grows larger, those left to lag fall behind even further from the overshadowing provided by the expanding flower spike. The bulbs were planted in a quick-draining mix containing orchid bark. The oak-looking seedlings are a mystery. Author's note (Because I've always wanted to write one. ): I couldn't help writing in third person after listening to the audio book Dead Tomorrow by British author Peter James. Can you tell I wrote this with an English accent?